Can you determine the diagnosis? 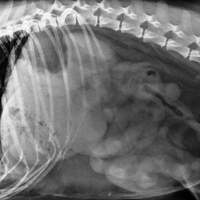 Take at look at the radiographs, then Alan Lipman, DVM, DACVR, will explain his interpretation. A 14 y/o mixed–breed dog presented to DoveLewis laterally recumbent and hypotensive. A ventrodorsal and lateral radiograph of the abdomen was performed. The lateral radiograph is included. The lateral radiograph demonstrates a mottled region of gas opacity involving the cranioventral abdomen. This is identified cranial and ventral to the position of the stomach and other gas filled enteric structures. This was thought to reflect gas within the paren¬chyma of the liver. Abdominal ultrasound was performed which demonstrated a gas–filled mass effect within the right liver. No evidence of gas within the bili¬ary structures or portal vasculature was identified. Hepatic abscess was the most likely diagnosis based on this appearance and the clinical signs presented. Hepatic abscess may be caused by introduction of bacteria secondary to a penetrating injury, spread from an adjacent septic focus such as an ascending biliary tract infection, hematogenous infection via the portal vein or hepatic artery or secondary to hepatic carcinoma or other neoplasia. Gas within the liver and /or biliary system can occur from several different causes. Gas within the gallbladder and biliary ducts can result from emphysematous cholangitis. Both gas forming bacteria within the biliary tract and reflux of duodenal gas possibly secondary to duodenitis may result in this process. Gas within the portal vasculature from severe gastroenteritis, ulcerative gastritis or gastric volvulus is also seen. This can often be differentiated from an abscess by identifying a branching pattern of gas within the hilus and peripheral regions of the liver. Hepatic abscess will typically appear as an amorphous or mottled gas pattern. Superimposed subcutaneous gas should be eliminated as a possibility by examining both orthogonal projections. Free gas within the peritoneal cavity caused by rupture of a hollow viscus or a penetrating injury typically outlines the serosal surfaces of the cranial abdominal viscera and may have either a curvilinear or irregular shape between serosal surfaces.